With the elegant look of cut crystal without the cost (you really, really can't tell by just looking! 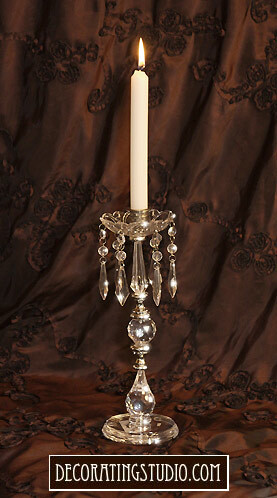 ), this candlestick features six diamond-shaped pendants. Clear Acrylic with silver metal accents and metal candle cup. For taper size candles only. 3 3/4" x 3 3/4" x 12 " high (without candle).